However, adding a visual complement to the production scheduling system allows companies to actually reach the lean manufacturing goals that offer a significant reduction in actual costs, streamlined workflows, improved staff efficiency, and higher standard quality controls. Furthermore, these reasons for factoring the human element back into the production scheduling equation provides an effective edge over worldwide competitors who operate under less stringent compliance regulations. No two manufacturing or distribution companies conduct operations identically. Therefore, alterations to customer orders, substitution preferences, line change-overs to accommodate inventory availability, or unforeseen circumstances that essentially require an audible call at the line of scrimmage, just aren’t possible without manual access and schedule input capabilities. Which is exactly why the supply chain and manufacturing scheduling systems used to organize activities must contain a visualization accessory, such as a Gantt chart. Gantt charts are inherently easy to understand and do not require hours of special training or expensive courses. Administrators and staff personnel can intuitively manipulate manufacturing scheduling, allowing alterations to pre-programmed algorithms with simplified manual access. 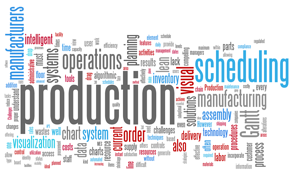 With a Gantt chart, company administrators can quickly view work-in-progress inventories, and subsequently arrange manufacturing scheduling to optimize production capabilities and inventory levels, effortlessly incorporating lean manufacturing principles that minimize operational costs. A Gantt chart software addition becomes an excellent tool for communicating with floor employees and fostering an environment of unity in the production facility. Employees can quickly comprehend and view crucial tasks, without having to wait for verbal instruction. Gantt charts that are optimized for interactive use allows company administrators to effectively manage production and distribution runs to minimize lead times. This means reaction times to manufacturing scheduling changes improve. Using a visualization tool like a Gantt chart allows staff personnel to develop “what if” type scenarios, and calculate resource capacity according to supplier information. For instance, if a supplier informs the procurement department about unanticipated shortages or shipping delays on consumable items, the manufacturing schedule can be quickly altered to maintain production efficiency, adroitly avoiding costly work stoppages. Utilizing a Gantt chart prevents responsibility confusion. Every aspect involved in any given task is clearly outlined, and its relevance to overall operations easily understood, providing department managers with the accountability tools to ensure acceptable employee performances. Gantt charts simplify reporting procedures, allowing employees to create progress assessments swiftly, and report that information in an easy to comprehend format, streamlining job activities, and saving time. Six Sigma and other lean production strategies focus on eliminating material and labor wastes by using a visual, spaghetti chart to establish optimized workflows. Gantt charts are similar, in that they provide a visual tool that generates high visibility into distribution and manufacturing scheduling, allowing businesses to formulate more effective schedules, optimize resources, and subsequently, increase profit margins. Manufacturers and distributors that utilize Gantt chart software have a superior ability to control picking processes and manufacturing scheduling tasks, improving operational fluidity with lean principles for maximum success. 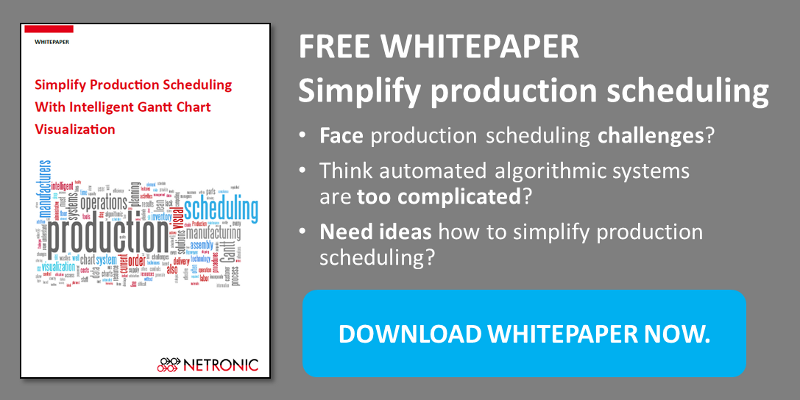 Want to learn more how to simplify production scheduling with intelligent visualization techniques? Download our free whitepaper. Want to see how we realize the visualization of production orders and resources for small manufacturers? Have a look at our job shop solution just plan it.